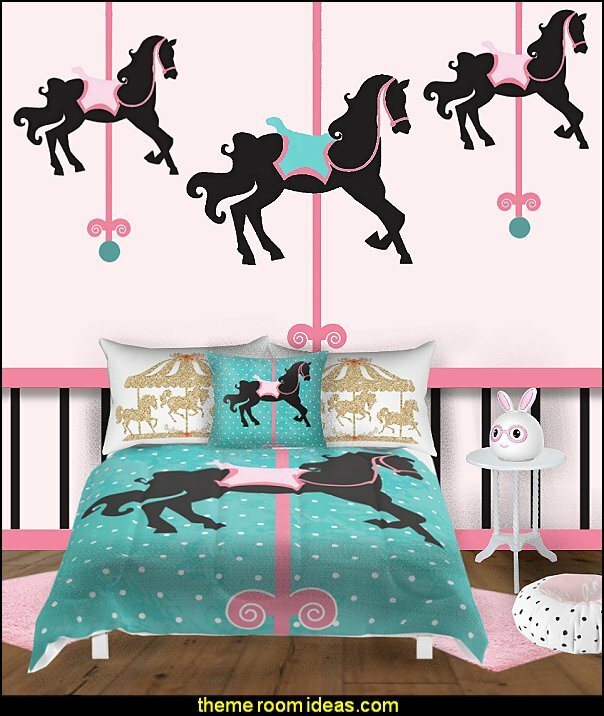 This charming design has a soft hand-painted look and will look lovely on the wall of a circus-themed bedroom or little girl's carousel themed nursery or room. 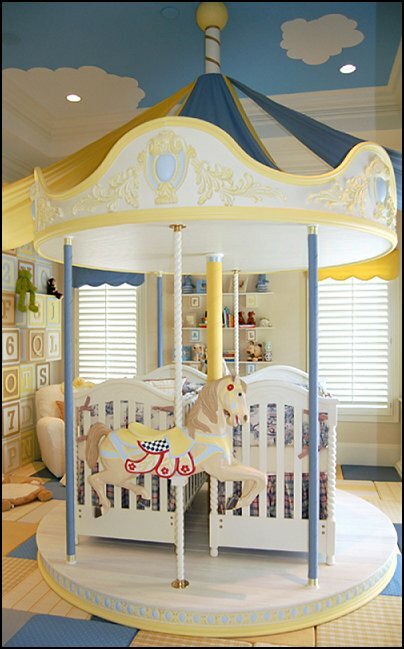 This beautiful rocking horse is an imaginative tribute to your child's favorite merry-go-round horse. 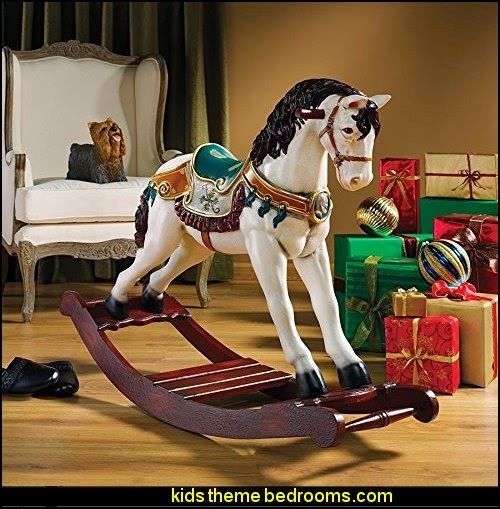 The best of both worlds - a rocking chair and a rocking horse! 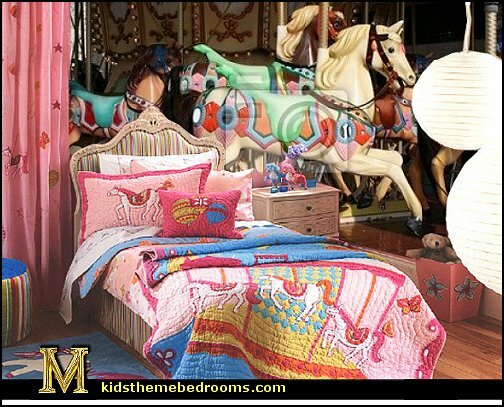 The Kiddie Ups Carousel Rocking Horse is the perfect decoration for any little girl and her carousel themed bedroom. 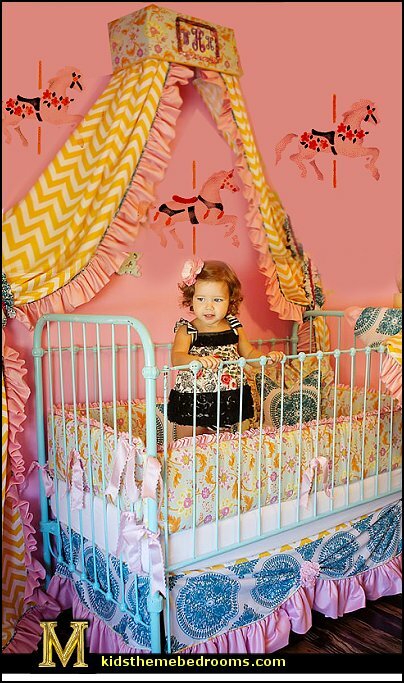 Kiddie Ups, beautifully handcrafted and hand-decorated wooden "heirlooms-to-be" that are sure to delight your favorite little rocker! 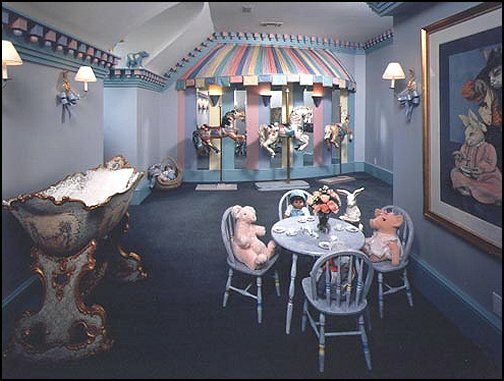 Creative and playful, each chair is more than a rocker and it is sure to become a buddy, a best friend and a treasured part of a special little one?s memories! 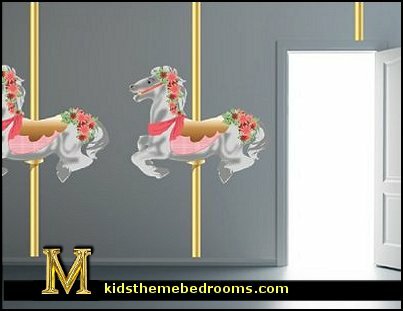 The Kiddie Ups Carousel Rocking Horse features a removable padded back rest and seat cushion, silky satin mane and ears and a gilded carousel pole. 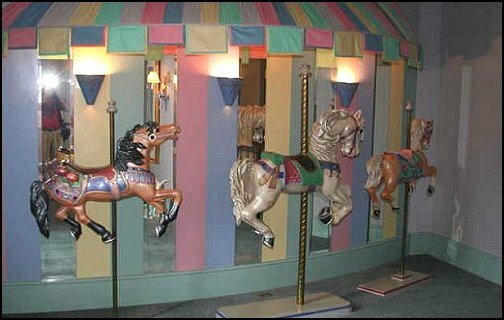 Entire Carousel pole extends to 120" Tall (10ft Tall) Horse Carousel: 40" Tall X 47"
Transform a room in a weekend or less. 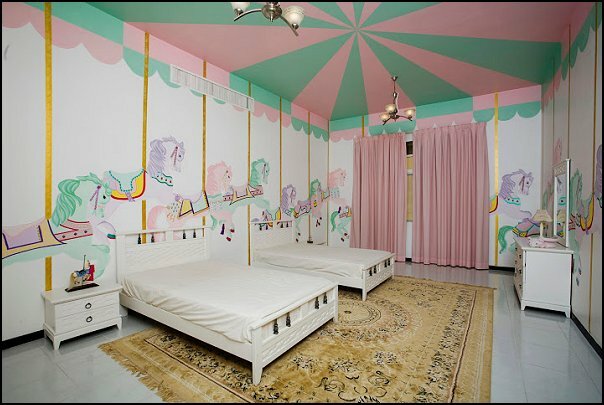 It's perfect for even those who think they are artistically challenged. It's fun and very easy to do. 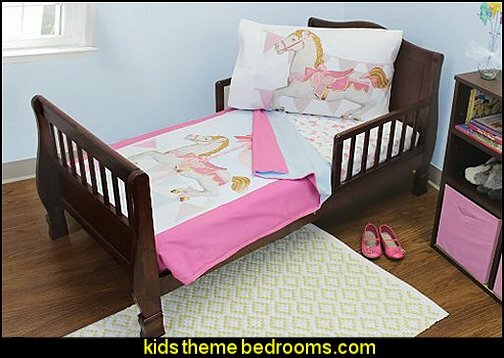 It's just like coloring in a big coloring book! 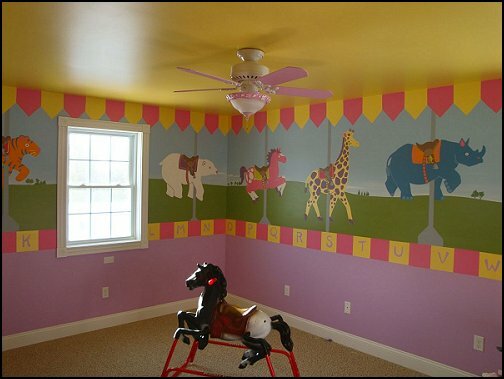 Your friends and family will think you are a brilliant artist. 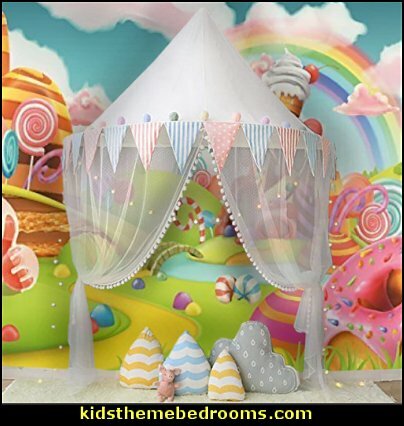 Each kit includes the reversible paper pattern, transfer paper, directions and a color guide. 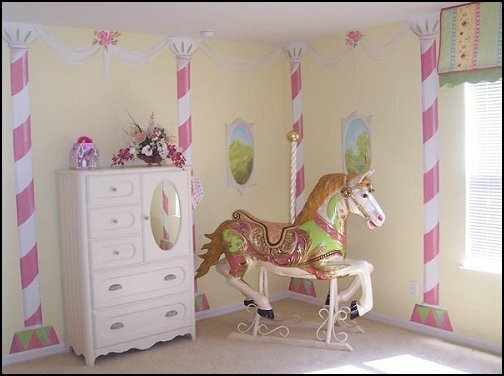 You will need to buy the paints, a couple of brushes and some painters tape. 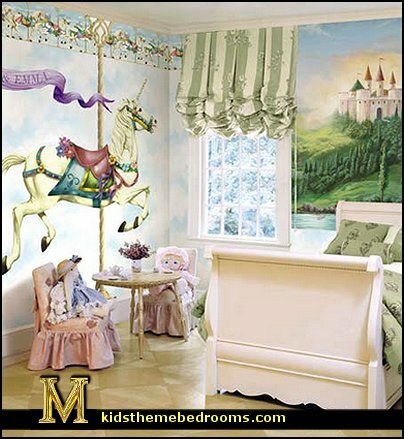 Murals are reversible and reusable. 1. 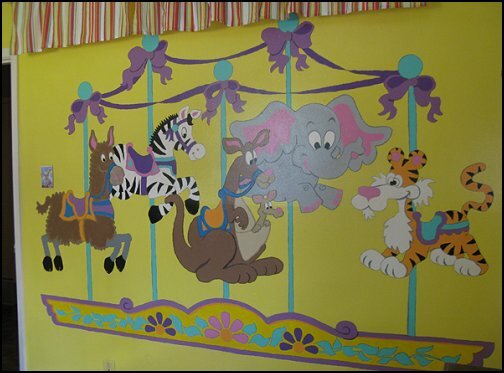 TAPE the transfer paper and pattern to the wall. 2. 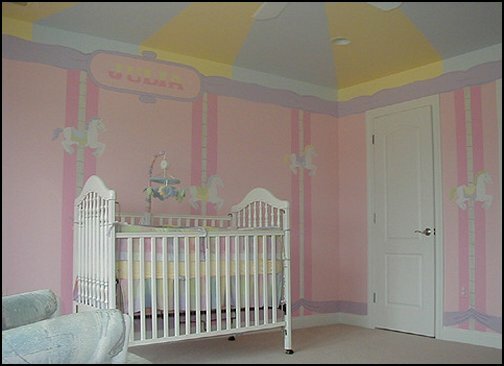 TRACE the design onto the wall. 3. 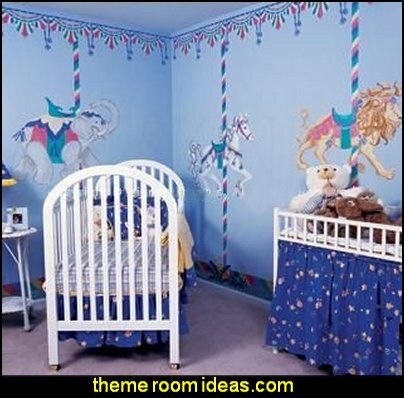 PAINT the areas with the corresponding colors on the color guide. 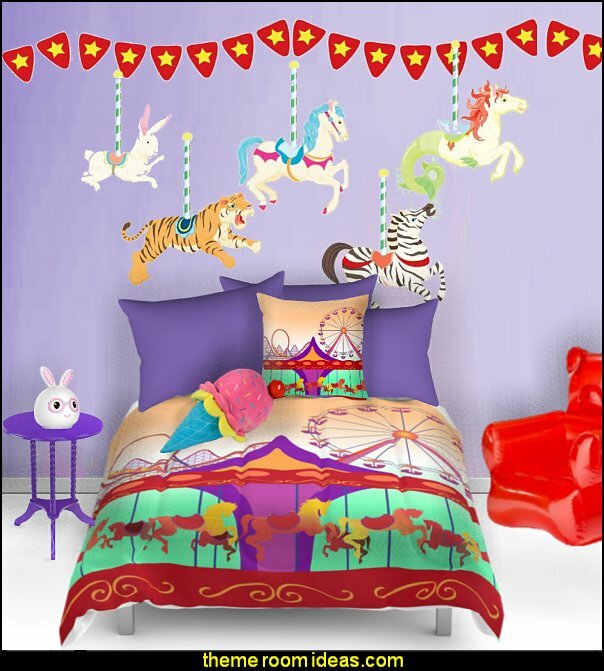 This adorable and colorful Carousel of Critters wall mural comes complete with an adorable elephant, a zany zebra, a luscious llama, a bouncy momma kangaroo and her curious little baby kangaroo tucked safely in her pouch! All of them are watching as the wacky wayward tiger spins around going the wrong way. 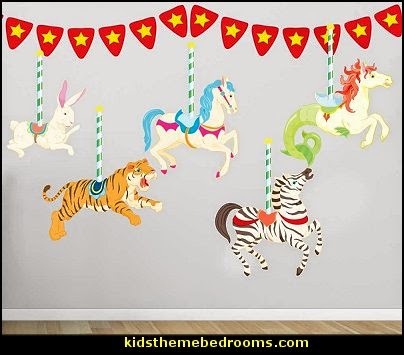 This colorful carousel is a perfect way to decorate a boy's or girl's room and is best painted on a light colored wall. 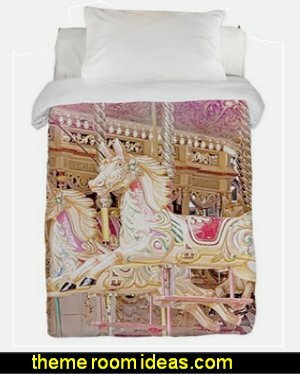 Showcasing fanciful creatures, modern art themes and soft textiles, Dwell Studio's latest children's bedding collection inspires dreamy and imaginative sleep. 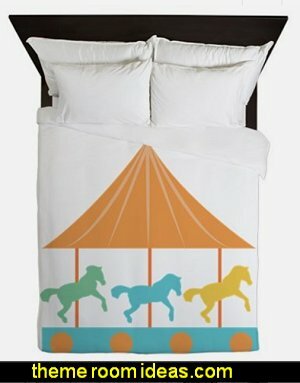 This lively duvet cover set delivers kids' beds a French coastal-inspired scene of painterly motifs mimicking colorful bunting flags. 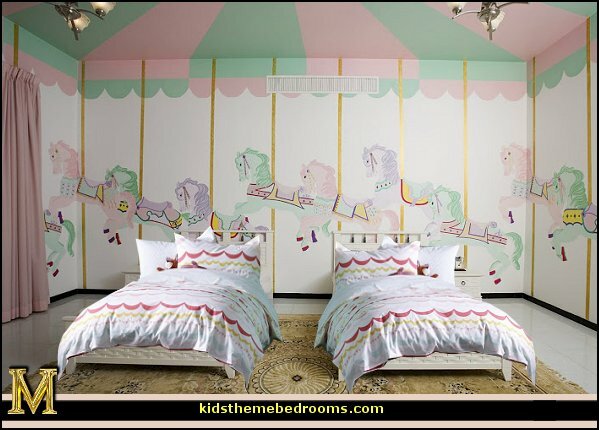 Perfect for a child's modern bedroom, its bright hues of coral, blue, yellow and white completes the youthful aesthetic with a fresh palette. 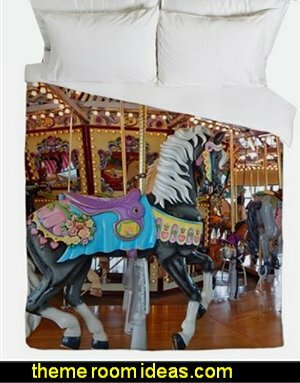 A 200 thread count construction ensures soft and lasting comfort. 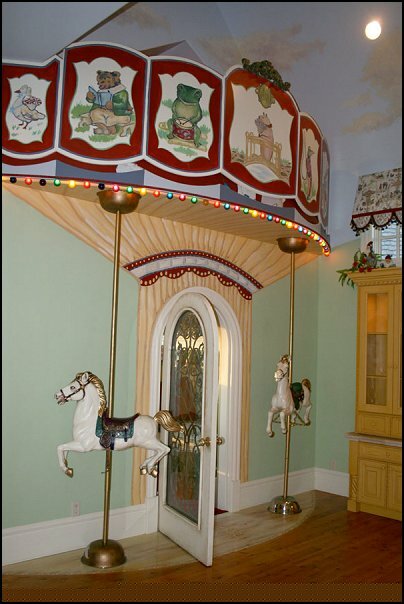 This over yard-long Victorian fantasy carousel rocking horse is so ready for Christmas that it doesn't even need a bow around its neck! 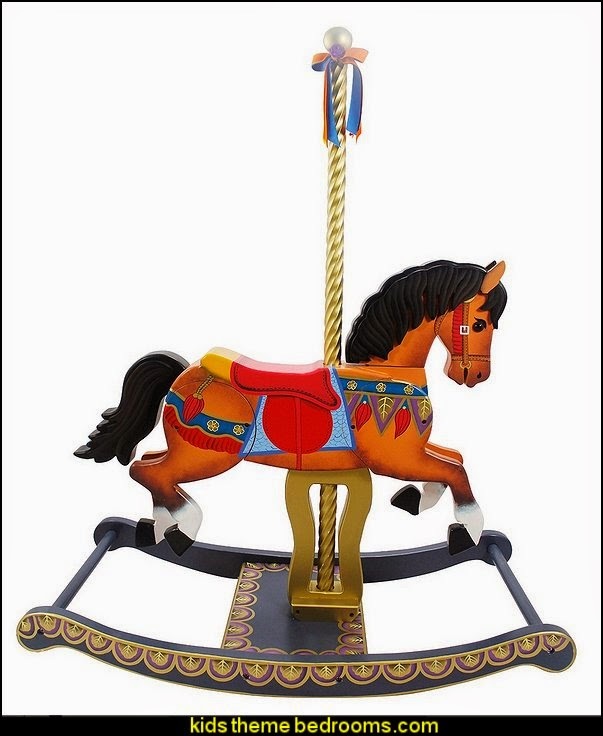 From the hands of a master carver, our straight-from-a-Dickens'-novel, display-sized version horse is carefully cast in quality, fiberglass-reinforced resin and hand-painted and gently distressed in ornately festive hues for window displays, outdoor scenes or nestled near your Christmas tree. 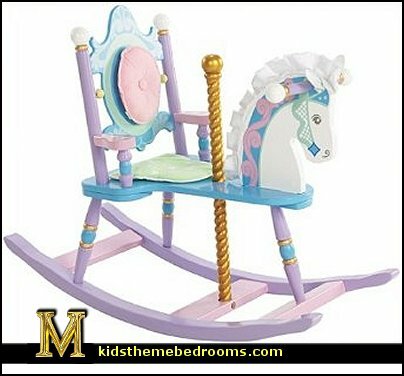 In addition to being an eye-catching rocking horse, it is mounted on a fitted wooden bow rocker, which adds to the visual authenticity, grace and elegance of this heirloom rocking horse. For display purposes only. 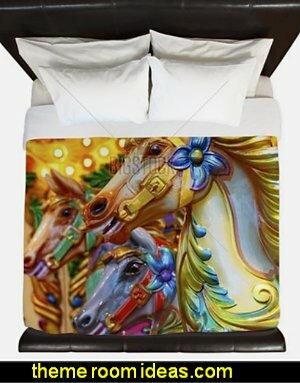 A majestic decoration for your Carousel themed bedroom or Carnival party! 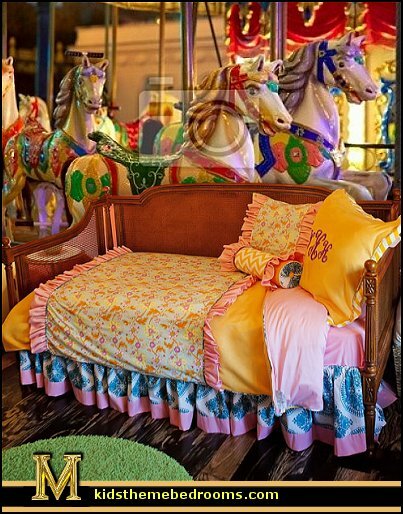 Carousel Horse is a black majestic horse with a hot pink and green saddle and purple, green and gold ribbon accents and gold pole. 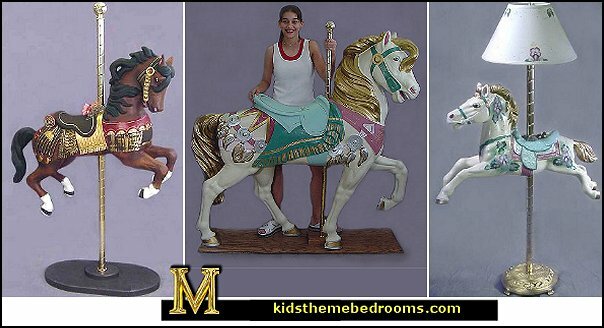 Each one-sided Carousel Horse measures 90 inches high x 57 inches wide and is made of cardboard. 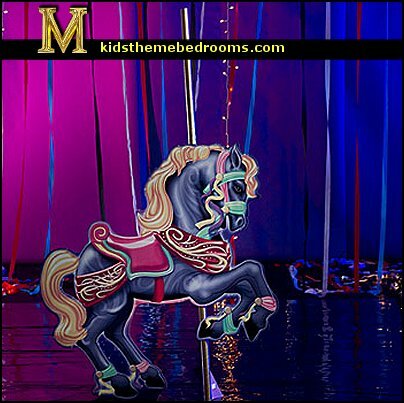 Use our Carousel Horse to create a fabulous decoration accent for your carnival themed party. 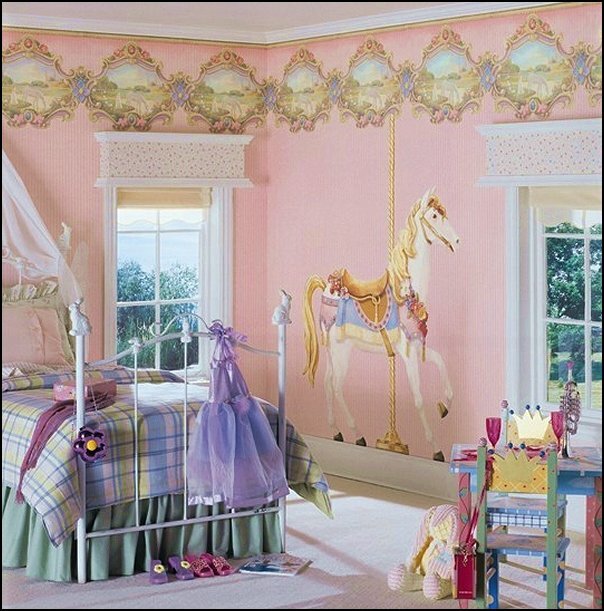 Stand alone or attach to the wall as a decorative wall mural.